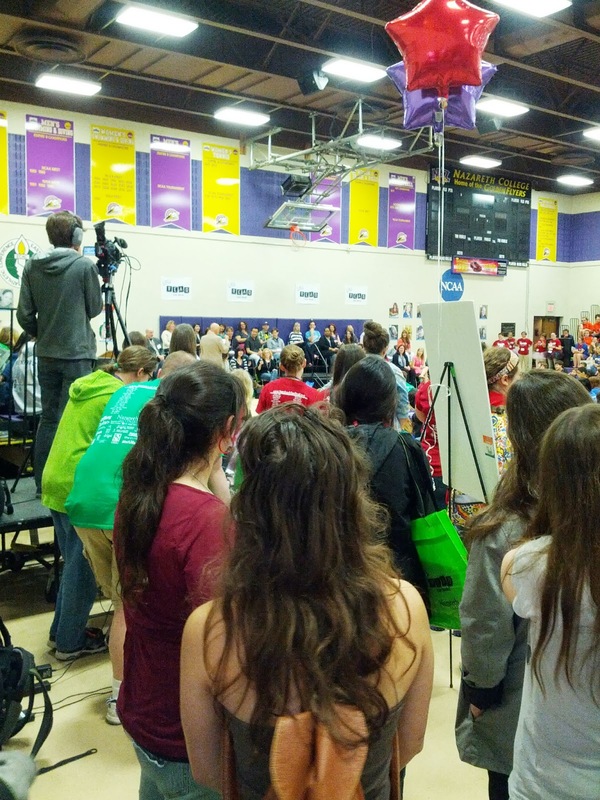 Jessabella Reads: Rochester Teen Book Festival Recap + Giveaways: Enter to win a RTBF tote bag filled with signed swag + two surprise 2013 releases! Rochester Teen Book Festival Recap + Giveaways: Enter to win a RTBF tote bag filled with signed swag + two surprise 2013 releases! I first drove up to Nazareth College, were the festival was being held, and I saw a TON of teens walking on the sidewalk paths with these green tote bags with the TBF logo on them. I got out of the car, and went immediately to meet up with Laura, a fellow YA blogger @ The Little Pink Boutique. This was the first time I had ever met her in person, so I was a bit nervous. I soon found out that she is a completely awesome, laid-back, sweet, and totally cool chick! If you don't follow her already, you should check out her blog ASAP! The first author session we went to was Megan Miranda and Gennifer Albin. It was just like a regular high school/college classroom. We sat in the front row and Megan and Gennifer just sat right on top of the teacher's desk! They both talked about their writing styles and how they come up with ideas. They realized that they both use a "what if" approach . As Gennifer is a teacher, she passed out slips of papers with "what if's" on them and asked us to elaborate on our phrases. Mine was "What if you lived in a famous house?". I never got a chance to do mine...oh well. Megan seemed like a super cool and chic woman. She is the perfect person to tell scary stories around a campfire. She was so kind and answered all of my questions. I would have loved to have had her as a teacher when I was in school. The second author session we sat in on was Alexandra Bracken and Robin Lafever's. First off let me say, I had NO idea that Alex Bracken is only 21 years old!!! She is soo pretty and really very sweet. She was on her way to being a lawyer when, in the middle of taking the LSATs, she realized that she couldn't go through with it. It seems to me that she made the correct decision. Her day job is in marketing for one of the "big" childrens publishers, and her third book is due to be released in October. I would say that's pretty great for 21! Robin LaFever's was the opposite story, as she wasn't published until very late in life. I loved the attitude she took towards it; saying that she knew she wanted to be a writer, and just never gave in to people telling her she couldn't do it. Both authors said they did a good of research for their work, and are therefore worried they are on the terror watchlist for what they look up on Google. For Alex these things include: map of the Los Angeles subway, how to make a bomb, and military information. Robin told a funny story about when she was writing Grave Mercy. She was doing research in her living room and had various library books spread out on the coffee table. Books with titles like, Deadliest Poisons and Five Ways to Kill a Man. So, Robin's son comes home and walks in the living roon. He glances at the books and then at her and says, "Mom, is there anything you need to tell me about you and Dad?"! I thought that was just hysterical. When I first saw Robin, I assumed she was going to be super serious and maybe a tad boring. I couldn't have been more off-base...and you know what they say about assumptions! She was soo freakin cool and funny. I really saw her in a new light after that session. 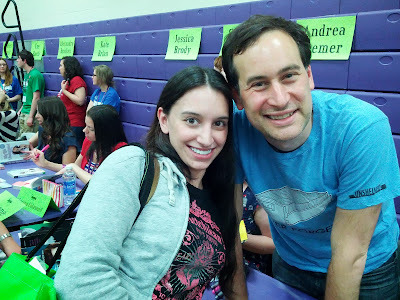 The third author session we attended was Andrea Cremer and David Levithan! I was SUPER excited to see these two authors, and OMG they did NOT disappoint! They did a reading from Invisibility, where Andrea read Elizabeth's lines and David read Stephen's lines/inner monologues. Let me just say, they were soo adorable together, and I'm betting that they were actors in a previous life. I just LOVED David and his quirky, nerdy, handsome self. Andrea was probably the cutest little red head I have ever seen! She was just so bubbly and full of life. They were both incredibly funny, and it was my favorite session of the day! The last session was Mary Pearson, Jessica Brody, and Marissa Meyer. Lauren DeStepfano was supposed to be there, but unfortunately she got sick half-way through the day so we missed her! (I know Laura was really looking forward to seeing her, so I felt really bad about that.) They talked about whether they were outliners or "pantsers" aka organic writers. I honestly don't remember who was which. (sorry!) I was super tired and hungry by this session, so I don't remember too much. What I do remember is that Jessica Brody seems like the kind of girl I would want as a best friend, Marissa Meyer is extremely pretty and had on adorable heels, and Mary Pearson spoke about the lengths to which a parent would go to save their child. Next came the AUTOGRAPH SESSION!!! Let me first say that although they do not give out ARC's or any books(you have to bring your own, or buy them there), the authors wait until everyone has had every book signed that they wanted signed before leaving. I got all of the books I brought signed, plus my copies of Invisibility and Dark Triumph which I purchased there. I also went up to a bunch of authors after the lines died down to ask them to sign bookmarks and other swag. (which they did giveaway) Everyone said yes, and was very happy to hear that I wanted some signed swag to give away to the readers of my blog. Now, during the autograph session, three awesome things happened! 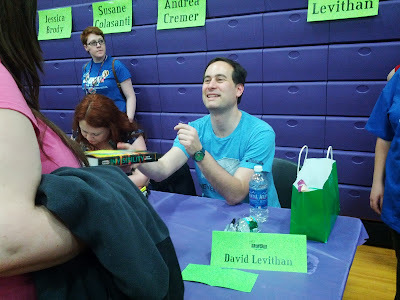 I had my picture taken with David Levithan!!! I got my copy of Invisibility signed by both Andrea and David! All in all I had an awesome day, met a wonderful new bloggy friend, saw/spoke with so many AMAZING authors and had all of my books signed by them! 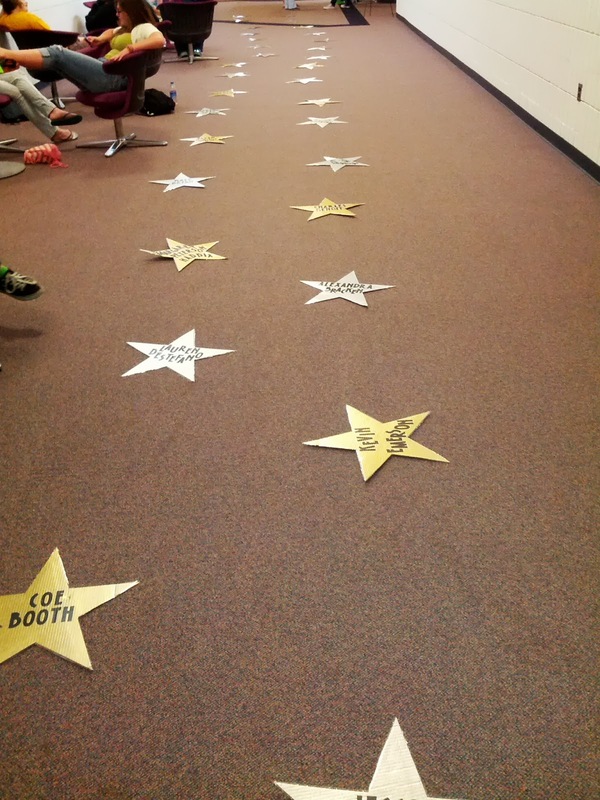 Check out what is happening at RTBF 2014! I am soo excited to see who is coming next year. They have a few authors confirmed already....Leigh Bardugo and Margaret Stohl among them!!! I will be hosting two giveaways. One for International followers, and one for U.S. followers. That means there will be TWO winners total! If you are an International reader, please do not enter in the U.S. Rafflecopter unless I can ship your prize to a U.S. address. I will be giving away ONE Rochester Teen Book Festival tote bag. The bag will be filled with swag(some signed) and two 2013 releases! Now this is going to be a surprise giveaway, so if you win, your bag could hold two finished copies, or one finsihed copy and one ARC, or two not yet releases ARCs. Point is, one winner will get a RTBF tote, swag, and two books from 2013! One international follower will win TWO 2013 releases from The Book Depository! It will still be a surprise giveaway, so I will choose which two books you get. Note: No one, U.S. or International, will get to choose their books. It will be a fun surprise for all! BUTTTTT....I will ask the winners for a wish-list from Goodreads, Amazon, or wherever, and do my best to make sure you get at least one book from it. This goes for U.S. & International. Trust me guys, I'm super nice and love to see my readers excited, so I promise to do my best so that you will be happy with your books! I selected this post to be featured on Blog Nation. Please visit the site and vote for my blog! Thank you so much for making this giveaway also international. Wow, this is totally awesome. I wish I could have gone to this for sure! Sounds like an awesome time! Sounds like you had a blast at the festival! Thanks for this awesome giveaway! Ohh I'm sooo jealous!! :) It seems that you had a great time. I am so jealous you got to meet David Levithan, he is one of my favorite authors, that is so awesome! Thanks for the giveaway! When I went up to Katie Brian, it was the first time she had seen a Hereafter ARC too. lol We should definitely make plans to meet up ahead of time for next year. I'm glad you had such a great time! I've already started stalking the site for next year's authors but Leigh Bardugo must have been added since I last looked. Awesome! WOW! Sounds like this event was a lot of fun! Thanks for sharing! It looks like you had a great time!!! thanks for the giveaway!!! I'm always envious of people on the east coast because they have such great events happening. Glad you had a great time! Ooo... this looks like so much fun! I wish I had gone to this! I only live an hour and a half from Rochester! Crazy. Super jealous you got to go!! but Im happy for you!!! Also, feel free to stop by my blog to enter my $100 Blogoversary Giveaway! Thanks! It was super fun. It was so great meeting you at BEA, I hope you had as much fun as I did! i am envy u...but congratulation..i feel happy for u too.. If only I live in the US! Wish I could see the authors and got their autographs. Thanks for the giveaway! Oh my gosh! This sounds so awesome. I wish I could have been there and met all of these awesome authors too. I'd love to go to something like this and meet cool people sometime, but alas, I live int he middle of nowhere. Sounds like fun. But, I don't have a wishlist. Well, you can always still enter, and if you win, I could just surprise you with two books that I loved, and therefore hope you would love as well. Thanks for such a fantastic and fun giveaway! I just love surprises! Looks like it was fun.and thanks for the int giveaway! Thanks for this giveaway. Great that you also did an international one!! This sounds like such a fantastic event, and you had a great time! Jealous! Thank you so much for offering such a great giveaway! I'm pretty sure I entered the wrong information from the Bloglovin' entry it should be thepurplebookshelf instead of Brianna. This sounds great, and I'm so glad you had such fun!! I read another blogger's recap and she had similarly glowing things to say. I'd love to be able to go to something like that! Oh, and I also had NO IDEA that Alex Bracket was ONLY 21!!! Holy crud, does that ever make me feel (1) OLD, and (2) uhhh, shall we say, a little less-than-accomplished!!! Phew. I've started Darkest Minds and the writing, I feel, is so mature, I'm still a little stunned at the news! Sounds like so much fun! I'm so jealous! Thanks for the giveaway! That sounds like a lot of fun! These authors sound great in person. I would be freaking out if I ever had a chance to meet Alexandra Bracken. I wish I could have gone.